Who needs a paper and pencil when you have an iPad? One reason why an iPad makes a great companion to a classroom or to a meeting is the versatility of typing in a quick note, jotting down a handwritten note, adding a photo or sketching your own image. This makes it a great note-taking tool no matter if you are writing down equations on a chalkboard or simply creating a list of to-do items for a project. But if you are going to get serious about note taking, you are going to need some apps. The Notes app that comes with the iPad is easy to overlook, but if you are looking for a basic note-taking application that includes the ability to sketch your own notes, add images and perform basic formatting such as bolded text or bulleted lists, it may very well do the trick.The biggest benefit of Notes is the ability to links notes across devices using iCloud. You can even view your Notes at iCloud.com, which means you can pull up your notes on your Windows-based PC. Evernote is a cloud-based note-taking app that has a similar easy-to-use feel as the Notes app but with some really cool features added on top of it. Evernote includes all of the basic formatting options you would expect. It also includes the ability to sketch out a note or attach a photo. One really awesome addition is the ability to capture documents, which is a very effective way to do a quick scan of a form or handwritten note. Similar to apps that act as a scanner, Evernote will automatically focus, snap the photo and crop the picture so that only the document is showing. Evernote also allows you to attach voice memos, and (of course), you can access all of your documents from any device that can connect to the web. But what really puts Evernote over the top when using it on your iPad is the ability to enhance the iPad's features. Evernote can attach to your calendar so that you can link a meeting with the notes you took at it. You can also use Evernote to leave yourself more advanced reminders than the Reminders app that comes with the iPad is capable of creating. If you don't use Evernote, Paper combines some of the basic features of Evernote with a world-class sketching tool. Paper is at its best when you are combining drawings with your handwritten notes, and it really goes hand-in-hand with Apple's new Pencil stylus. It includes the ability to type in notes and perform basic formatting, but this side of the app has less features than even the built in Notes app. However, the mere fact that you can easily share your sketching to the Notes app from within Paper may make that moot. If you don't need all of the advanced features of Evernote and primarily need to sketch out your notes, Paper may be the way to go. The coolest thing about most apps on this list is the price tag. Most of them are free, at least for the basic features. Notability is the exception, but for good reason. It may be the best pure note-taking app on the App Store. It doesn't have some of the task-related features of Evernote such as tying into your calendar, but if your main concern is the ability to take advanced notes, Notability is your top choice. Do you want to add detailed information to your notes? Notability will allow you to clip a webpage from a built-in browser and add it to your notes. This means you can link to more information about a note, or take notes of a webpage. Notability also allows you to be more precise in annotating pictures, shapes or webclips with handwritten notes. There is a magnify feature that allows you to write something in an expanded view and have it show up in a smaller area on the note, which is really great if you are using your index finger instead of a stylus. You can also save your notes to most popular cloud services like Dropbox or Google Drive, or simply let iCloud sync your notes across your devices. One thing we haven't covered is converting your handwritten notes into digital text. This can either be a key feature for some people or a wasted feature for others, but if you are in the group where it is a key feature, you will want to skip Evernote and Notability and shoot for Notes Plus. But don't think you are missing out on too much if you go this route. Notes Plus is a very good note-taking tool even if you don't take into account the handwriting-to-text capabilities. It has a built-in browser that allows you to search Google for images and then drag-and-drop them into your note, the ability to backup your notes to a cloud-based service like Dropbox and the ability to export your notes to PDF or various other formats. That is the question. And it is a very good question. 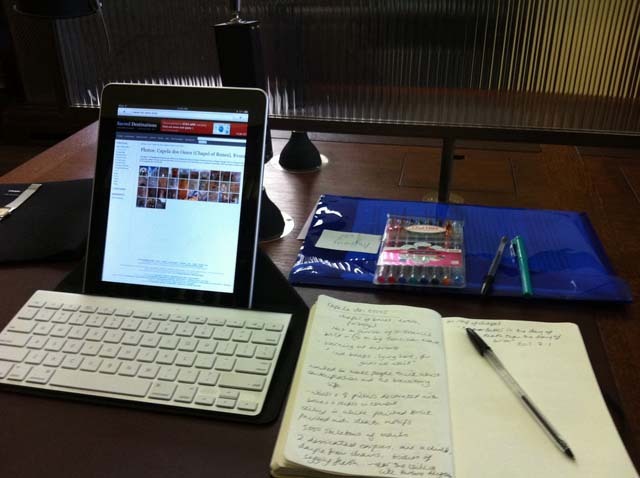 The best part about the iPad is its portability, and pairing it with a keyboard can be like turning it into a laptop. But sometimes, turning your iPad into a laptop can be a good thing. Whether or not to get a keyboard is personal decision and will depend on how fast you can type using the on-screen keyboard, but if you do go with a keyboard, you may want to go with Apple's Magic Keyboard, or if you have an iPad Pro, one of the new Smart Keyboards. Mainly because these keyboards support many of the special shortcut keys that include command-c to copy and command-v paste. When combined with the virtual touchpad, it really is like turning the iPad into a laptop. If you do end up with a non-Apple keyboard, make sure it supports those special shortcut keys. One thing that hasn't been mentioned is voice dictation and with good reason. The iPad is capable of performing voice dictation almost anywhere that the on-screen keyboard appears. There is a microphone button on the keyboard that turns on voice dictation mode, which means you can use your voice to take notes in almost any app, including most apps on this list. This is different from a voice memo, which actually leaves a sound file with your voice note in it. Voice dictation takes the words you speak and turns them into digital text.